... I am certain I have not a right feeling towards Women--at this moment I am striving to be just to them but I cannot--Is it because they fall so far beneath my Boyish imagination? When I was a Schoolboy I thought a fair Woman a pure Goddess, my mind was a soft nest in which some one of them slept though she knew it not--I have no right to expect more than their reality. I thought them etherial above Men--I find them perhaps equal.... I do not like to think insults in a Lady's Company--I commit a Crime with her which absence would have not known--Is it not extraordinary? When among Men I have no evil thoughts, no malice, no spleen--I feel free to speak or to be silent--I can listen and from every one I can learn--my hands are in my pockets I am free from all suspicion and comfortable. When I am among Women I have evil thoughts, malice spleen--I cannot speak or be silent--I am full of Suspicions and therefore listen to no thing--I am in a hurry to be gone--You must be charitable and put all this perversity to my being disappointed since Boyhood–. . . I could say a good deal about this but I will leave it in hopes of better and more worthy dispositions--and also content that I am wronging no one, for after all I do think better of Womankind than to suppose they care whether Mister John Keats five feet high likes them or not. ...I hope I shall never marry. Though the most beautiful Creature were waiting for me at the end of a Journey or a walk; though the carpet were of Silk, the Curtains of the morning Clouds; the chairs and Sofa stuffed with Cygnet's down; the food Manna, the Wine beyond Claret, the Window opening on Winandermere, I should not feel--or rather my Happiness would not be so fine, as my Solitude is sublime. Then instead of what I have described, there is a Sublimity to welcome me home--The roaring of the wind is my wife and the Stars through the windowpane are my Children. The mighty abstract Idea I have of Beauty in all things stifles the more divided and minute domestic happiness--an amiable wife and sweet Children I contemplate as a part of that Beauty. but I must have a thousand of those beautiful particles to fill up my heart. I feel more and more every day, as my imagination strengthens, that I do not live in this world alone but in a thousand worlds--No sooner am I alone than shapes of epic greatness are stationed around me, and serve my Spirit. . . He goes on to explain, "the opinion I have of the generallity of women--who appear to me as children to whom I would rather give a Sugar Plum than my time, form a barrier against Matrimony which I rejoice in. " I have vex'd you too much. But for Love! Can I help it? You are always new. The last of your kisses was ever the gracefullest. When you pass'd my window home yesterday, I was filled with as much admiration as if I had then seen you for the first time. You uttered a half complaint once that I only lov'd your Beauty. Have I nothing else then to love in you but that? Do not I see a heart naturally furnish'd with wings imprison itself with me? No ill prospect has been able to turn your thoughts a moment from me. This perhaps should be as much a subject of sorrow as joy–but I will not talk of that. . . . Despite the ambivalence expressed in such letters, Keats was eager to be with Fanny; he urged Fanny "whenever you know me to be alone, come, no matter what day." I am patient, resigned, very resigned. I know my Keats is happy, I know my Keats is happy, happier a thousand times than he could have been here, for Fanny, you do not, you never can know how much he has suffered. So much that I do believe, were it in my power I would not bring him back. All that grieves me now is that I was not with him, and so near it as I was. . . . he at least was never deceived about his complaint, though the Doctors were ignorant and unfeeling enough to send him to that wretched country to die, for it is now known that his recovery was impossible before he left us, and he might have died here with so many friends to soothe him and me me with him. All we have to console ourselves with is the great joy he felt that all his misfortunes were at an end. 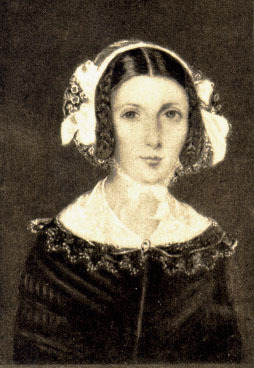 Fanny Brawne married in 1833, had three children, and died at the age of 65.